KYB Suspension - The 2016 RM-Z250’s suspension has been completely redesigned for improved handling, reduced weight and increased overall performance. 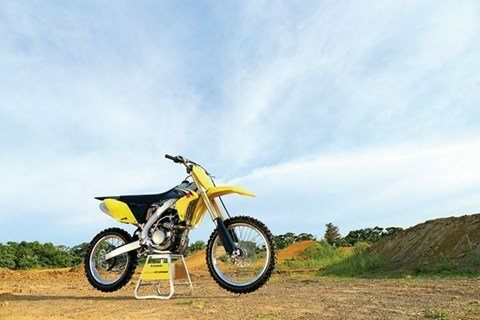 The new PSF2 air fork eliminates the coil spring, the heaviest part of a spring fork, resulting in a 1kg weight savings, and adjusting the suspension is now as simple as adding or subtracting air. 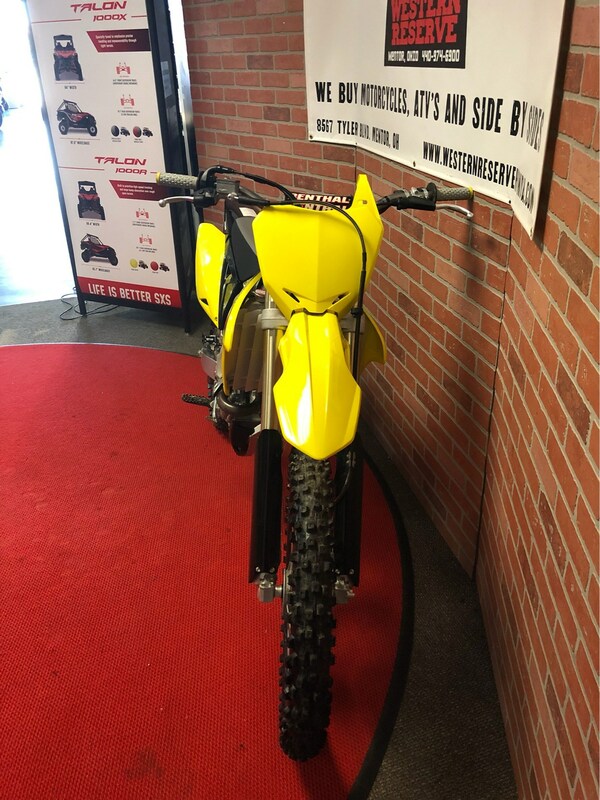 Suzuki Holeshot Assist Control (S-HAC) - Designed for ease of use and maximum control of power to the ground, S-HAC lets you match the engine’s power delivery to the starting conditions. 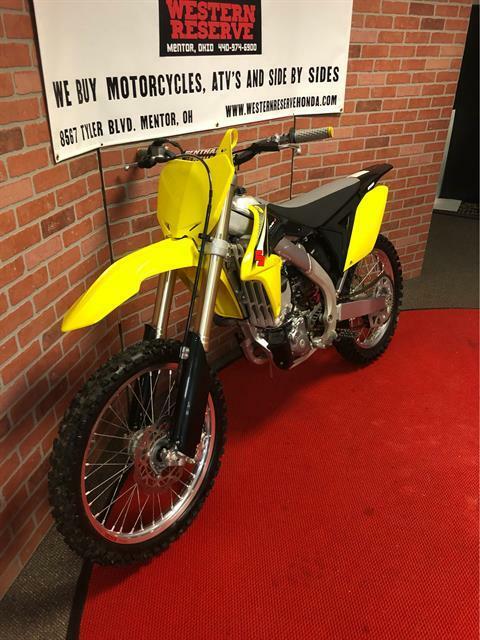 A new, three-stage version of S-HAC fitted to the 2016 RM-Z250 adjusts the ignition map for the initial moment of launch, then re-adjusts timing for the time the motorcycle moves through the starting gate area, then another adjustment is applied during the longer primary acceleration period. 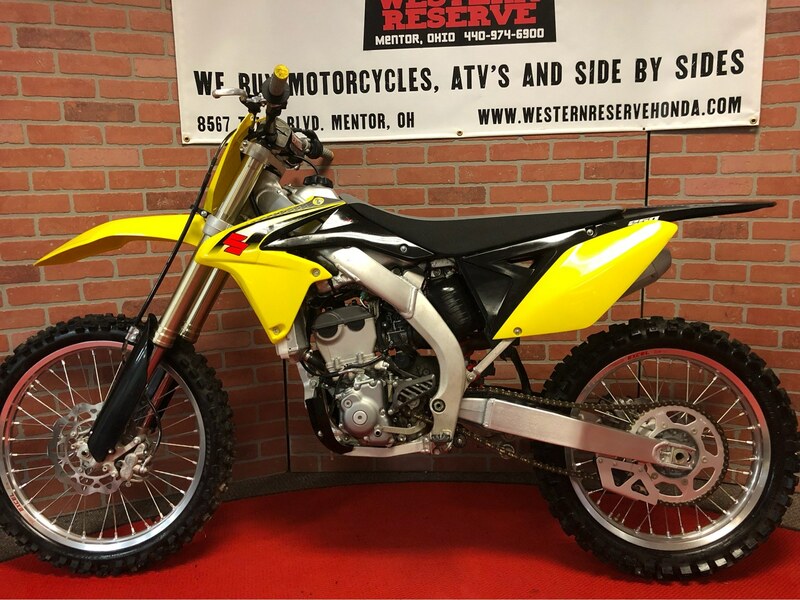 Redesigned Frame - Designed to improve the RMZ-Z250’s already outstanding handling characteristics, the 2016 frame has been modified resulting in greater cornering and straight line performance. Overall frame weight has been lowered by 2.5%. 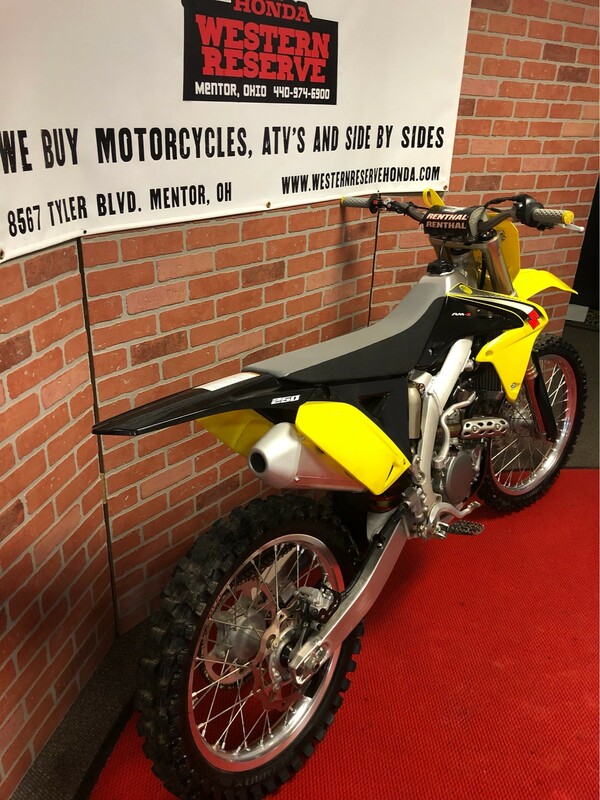 The 2016 RM-Z250’s suspension has been completely redesigned for improved handling, reduced weight and increased overall performance. Renthal aluminum Fatbar is standard equipment. 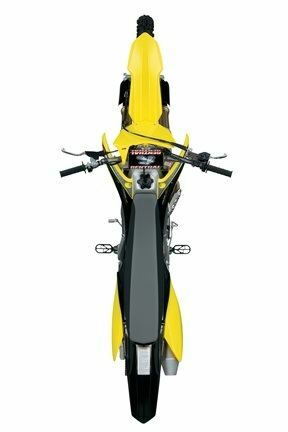 It has more strength and less vibration than straight aluminum handlebars. 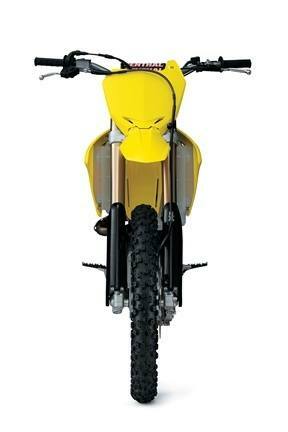 The new PSF2 air fork eliminates the coil spring, the heaviest part of a spring fork, resulting in a 1kg weight savings. 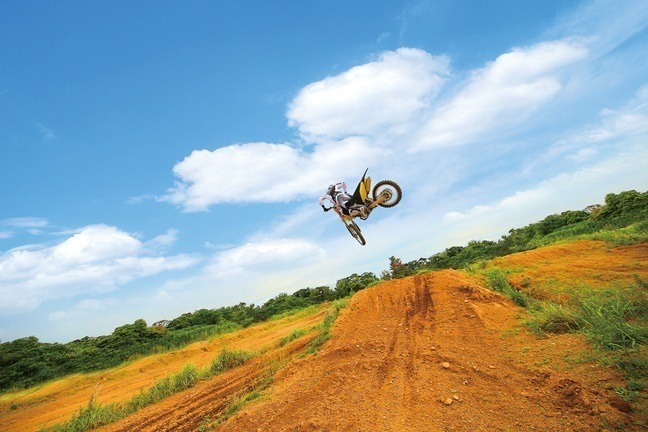 Adjusting the suspension is now as simple as adding or subtracting air. Just apply one common air pressure setting to each fork leg. 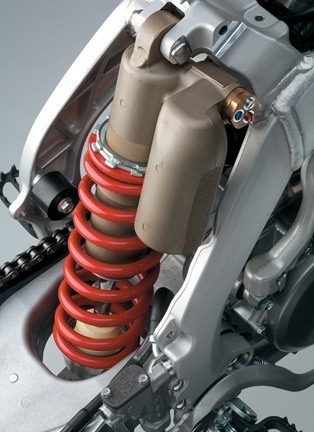 No need for complicated and costly spring changes. Additionally, rebound damping is now 2-way adjustable with high- and low-speed setting screws. Designed to improve the RMZ-Z250’s already outstanding handling characteristics, the 2016 frame has been modified resulting in greater cornering and straight line performance. 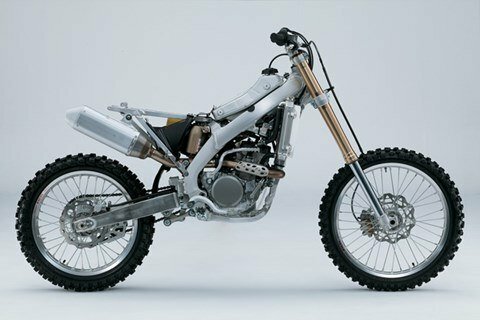 Overall frame weight lowered by 2.5%. 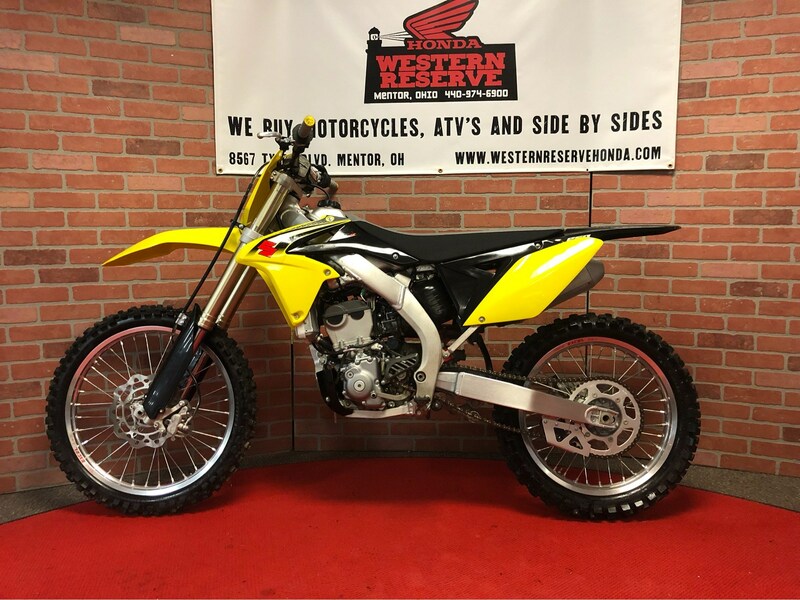 New rib structure, redesigned connection parts, and lengthened steering head increase frame rigidity. The gripper seat has projecting cross-shaped patterns on its top surface to provide additional adhesion and rider confidence. The RM-Z250’s fuel-injection system delivers precise throttle response and consistent performance. 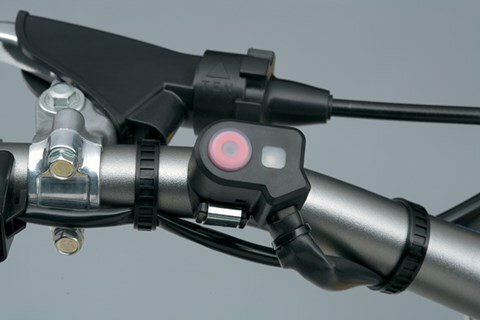 By plugging in either of two fuel-setting couplers (in addition to stock), riders can opt for a richer or leaner fuel setting to make the most of any riding conditions. 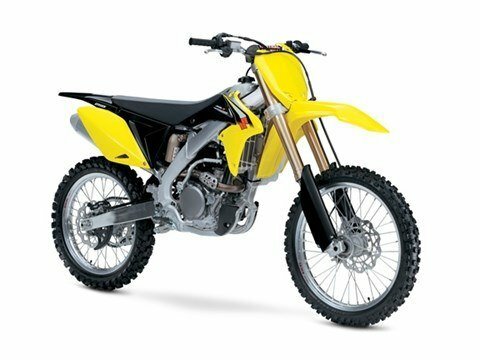 The RM-Z250's cooling efficiency is increased thanks to redesigned radiator fins and revised water hose routing, making the bike's high performance power output more stable, even in the most demanding conditions. RM-Z250's also features a new by-pass hose routing to simplify occasional radiator maintenance. FI indicator light (optional part: 36380-28H00) has hour meter function, indicates how many hours the engine has been running. 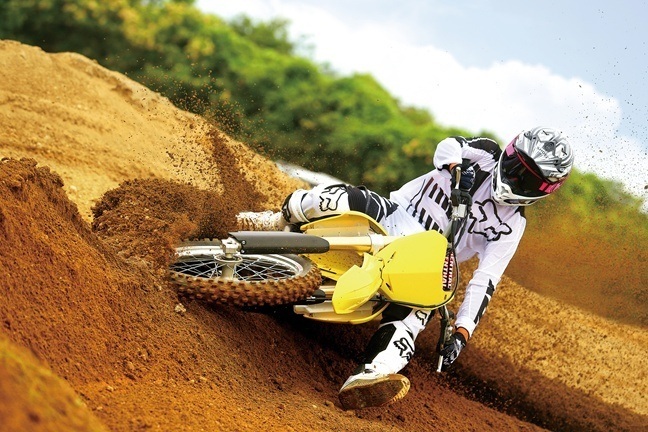 Suzuki Holeshot Assist Control (S-HAC) is a selectable launch mode system derived straight from our factory race bikes. S-HAC helps the riders takeoff from the starting gate for an early lead. 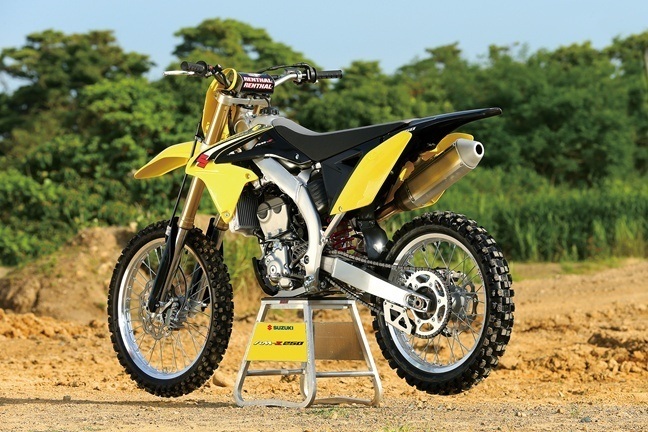 S-HAC was introduced in 2014 RM-Z450, and now a refined version is on the RM-Z250. 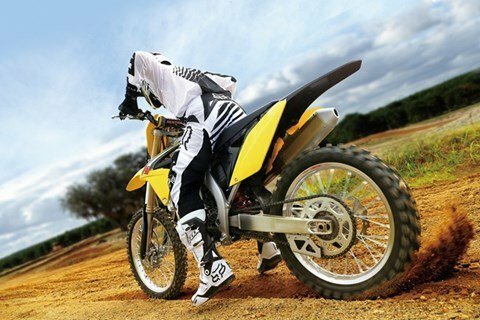 There are three modes riders can choose for the best option per their skill level and starting conditions. 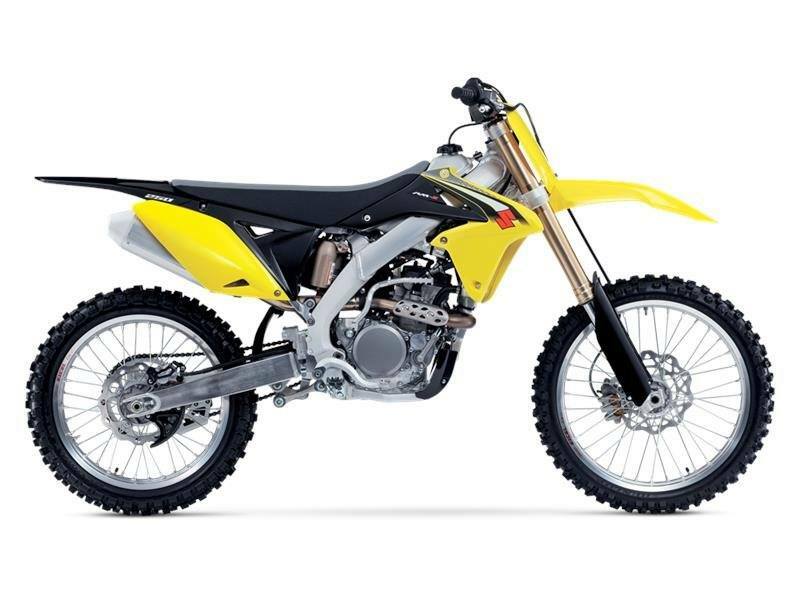 The RM-Z250s engine has been refined so mid-range power and torque is enhanced while maximum power is maintained. 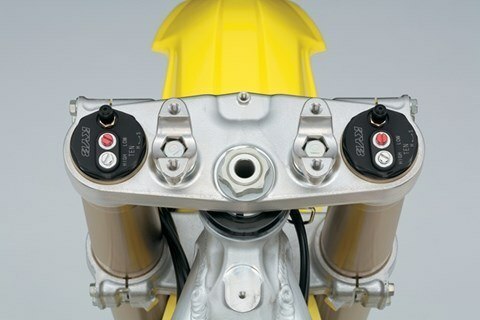 Power delivery is smoother and linear for easier control. New piston, piston pin & piston ring improve durability and ring-sealing. The transmission design achieves a smooth yet solid shift feel. 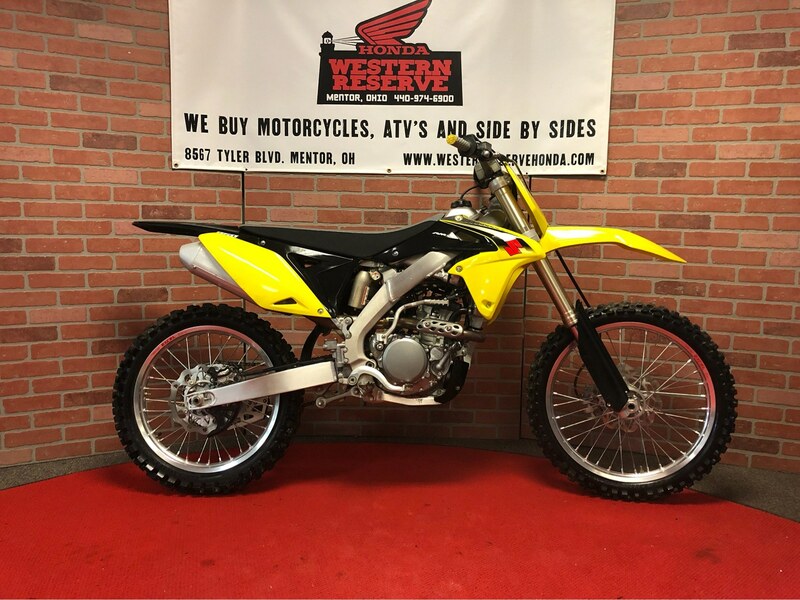 From the method of fastening the sprocket to the drive shaft, to the design of the gears themselves, this transmission attains a quick shift feel.